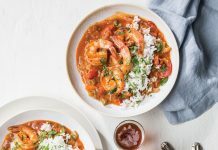 As the White Shrimp season hits its stride in early autumn, we’re always looking for different dishes that highlight the crustacean’s sweet flavor and delicate texture. 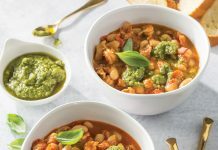 This lightened-up soup takes some of the season’s best flavors and melds them with a hearty dose of Louisiana shrimp. You’ll want to eat this over and over again as the weather cools off. In a Dutch oven, heat 2 tablespoons butter and lemon juice over medium heat. Add shrimp; cook until shrimp are pink and firm, about 3 minutes. Using a slotted spoon, transfer shrimp to a warm plate. Add remaining 2 tablespoons butter to pot. Add celery and carrot; cook for 2 minutes, stirring occasionally. Add onion; cook for 4 minutes, stirring occasionally. Add corn and garlic; cook for 1 minute, stirring occasionally. Add flour; cook for 2 minutes, stirring constantly. Stir in wine, and cook, scraping browned bits from bottom of pot with a wooden spoon. Gradually add stock, stirring until well combined; bring to a boil. Add potatoes, tomatoes, salt, black pepper, and red pepper; cook until potatoes are tender, about 15 minutes. Reduce heat to medium-low. Add shrimp; simmer until heated through, about 5 minutes. Serve with lemon wedges and French bread, if desired. 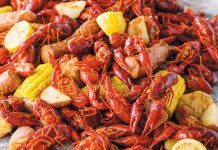 Find more recipes to get you ready for fall in the newest issue of Louisiana Cookin’. Had no white wine so used Marsala. Worked great. Gave it a more earthy flavor and brought up the shrimp flavor. Have to try it with white. I made this for my daughter and a couple of her college friends. I had no seafood stock, so substituted vegetable stock right out of the box. The soup was quick to put together, and it disappeared in a flash. To stretch the number of servings, you could add more shrimp and serve it over a bed of rice.